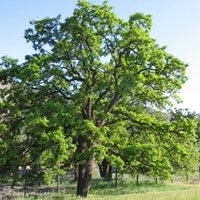 Garry Oak Tree (Quercus garryanna) - Ancient wisdom for knowing how to journey through and operate within alternate dimensions in a healthy and cohered way; expanding into alternate perceptions, receiving clear verbal, kinesthetic and visual information then returning to ordinary reality with ease. I AM the experience of being at home in all dimensions and realities including Earth. Garry Oak Tree Essence when you are hesitant to open into alternate realities or are having difficulty reintegrating into ordinary reality after going into an alternate reality such as ritual, extended spiritual practice, meditation retreat, shamanic journeying or channeling information from spirit and animal guides of other dimensions. Symptoms could include nervous system hypersensitivity, headaches, being spaced out and unable to think clearly about ordinary daily things, disassociating and not wanting to be a part of daily life or fear about what other people might think about your alternate reality experiences. Garry Oak Tree Essence is also helpful when you want better communication and ability to operate when you are in alternate dimensions/realities. Garry Oak Tree Essence assists you to comfortably move into, operate within, receive clear verbal, kinesthetic and visual information and move back out of alternate realities and dimensions. It holds the ancient knowledge of our ancestors about meeting and communing with nature beings, animal spirits, upper world spirit/cosmic guides and your Higher Self. It is an ally during your process of remembering that the experience of being a multidimensional person is as natural as breathing. This essence was made by the “no-pick” method. While the essence was being made, crystals of amber, icosahedron quartz, larimar, moldavite, red aventurine, red jasper, spirit quartz, tiger’s eye and drusy quartz were placed among the plants with the storage (mother) bottles. The sun acts as a transformer to step down spiritual energies from higher dimensions. While the essence was being made, Amber acted as a lens to receive and focus sunlight for this purpose. Icosahedron cut quartz has 20 (5X4) equilateral sides. It is a bridge between the 5th Dimension - the entry into the unified Spiritual realms - and the 4 cardinal directions (N, S, E, W) on Earth. Larimar is a powerful stone of balance, healing nurturance and stepping outside of your ego; it also softens the high energies of moldavite. Moldavite was formed as part of meteorites that fell to Earth more than 15 million years ago. It serves the inhabitants of Earth by facilitating strong, clear, and direct interdimensional interconnectedness between your consciousness and the higher planes of Light. Red aventurine aligns you with your highest path and encourages fortitude, discernment, commitment and perseverance. Red Japser balances the chakras, assists with journeying to higher frequency dimensions and keeps you grounded to the stabilizing energies of Earth. Spirit Quartz (citrine with amethyst) clears blockages in the solar plexus chakra that hold the “shoulds” and “should nots” of your upbringing, increases your self worth and encourages you to claim your rightful power. It supports you to manifest the goals of your Higher Self. Tiger’s eye brings discernment, grounding, physical vitality, confidence and practical action. Drusy quartz crystals help to energize and stabilize your subtle bodies. The actions of the crystals inform the way this flower essence seats into the physical body.